I really think Romy is After Hours’ “Masterpiece”! He has an air about him, that tells me he will command centre stage. This typey Hanoverian looks a lot like his dad – Blue Hors Romanov, Champion and Vice Champion of Dressage in Denmark, producer of multiple stallion sons, Champion Mares, and Young Horse dressage stars. Romanov is currently training with Edward Gal, and targetted towards the 2012 Olympics. 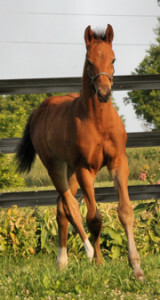 Romy is leggy, with an uphill build, and magnificent shoulder and topline. 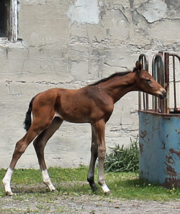 A special foal, pictured here up to 4 months old. Below is a videosnippet, from September 2012, showing Romy at 4 months. UPDATE: Romy has been SOLD to an experienced and passionate horsewoman in MI. Both she and I are very excited about his future prospects.